http://petitions.moveon.org/sign/restore-health-insurance It only has six signatures, so please sign it if you believe in it. For background, US antitrust laws are federal and state government laws, which regulate corporations to promote fair competition in the marketplace. They can prevent monopolies from forming and greatly benefit consumers. However, antitrust laws as they are currently written affect physicians much differently. They essentially make cooperation within the medical community nearly impossible by criminalizing discussion between physicians on how much money they make. Of course, there is a lot more to cooperation than just discussing pricing, but this is significant because this lack of transparency surrounding doctor’s wages allows insurance companies to pay certain doctors different amounts for doing the same procedures. This defeats the entire purpose of antitrust law. In a similar way, insurance companies can also dictate the paths of patients by deciding how much to cover and what not to cover at all. Antitrust laws have to be rewritten for medicine to apply to more predatory, large corporations, as opposed to physicians. The only part of my dad’s article I disagree with is his mention of Sweden’s healthcare. They do have excellent healthcare, and health care costs are actually lower there too. 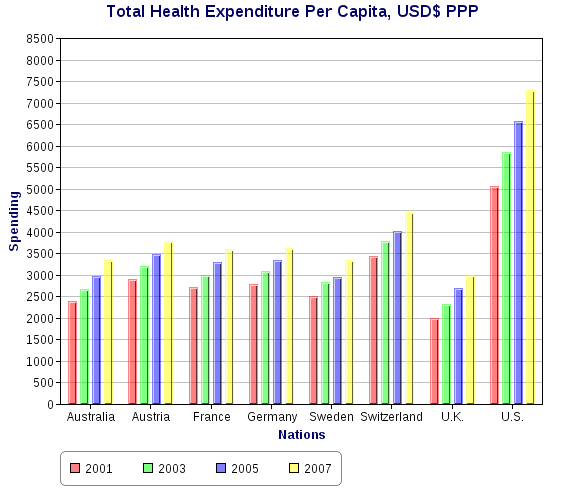 Healthcare costs to cover everyone in Sweden amount to about 9% of their GDP. I haven’t written much about “Obamacare” mainly because I didn’t think the Act would help many people. I also wanted to see how much of it actually came into effect before writing about it. (Another unfulfilled promise from Obama wouldn’t be surprising.) I thought Obama should have started by advocating for a single-payer system. While the Affordable Healthcare Act has covered more individuals, and it has likely helped some, it doesn’t insure everyone, and it doesn’t establish healthcare as a right, which is most important. The Act establishes insurance as a right, which essentially means we have the right to file claims, wait an unreasonable amount of time, suffer complications from our worsening conditions and eventually have our claims denied most likely. Owners of large, for-profit hospitals and insurance companies just care about the money, for the most part, and this is the major reason healthcare is a disaster in America. Large insurance companies (of all kinds) don’t want to pay when someone files a legitimate claim. They along with the owners of large for-profit hospitals also don’t want to pay doctors for doing hard work, so doctors often struggle to provide good, timely care and many patients struggle to get it. Some noble doctors provide free care out of compassion, but people still die in this system that leaves many out. I think the reason we have had such difficulty getting to a single payer system in America is that the US government doesn’t want to pay the bill for it, even though most Americans do. And major American medical insurance companies don’t want to do it because it would put them out of business. It all comes down to their bottom line. America’s healthcare is expensive and in bad shape because of greed, not among the majority of doctors, but among owners of large for-profit insurance companies, big pharmaceutical companies, large hospitals, and corrupt politicians who collude with them and ensure they are fairly unregulated. But there are solutions, and I think rewriting antitrust laws in America would be a realistic, achievable step forward, as we work towards a single-payer system that provides everyone with healthcare. Healthcare could also be established as a right without any government by collectivizing hospitals and trading hospital services for other goods and services.